German entrepreneur and geostrategist Dr. Hubertus Hoffmann, Founder and President of the World Security Network, gets a first-hand impression of India and its cultural center Varanasi, the Hindu Holy City on the Ganges river: "India is now the most important country for the future of the world—a young country marching confidently towards the future. With its 1.1 billion inhabitants, currently every fifth man or woman on our planet is an Indian. It is an optimistic country with self-confidence and positive energy." In 2030 there will be more Indians living on this planet than Chinese—an estimated 1.5 billion vs. 1.4 billion. India is not only the largest democracy on earth but also the most interesting counter model to the state-controlled and politically centralized China. It looks now that the Indian elephant has turned into a tiger and will soon devour the Chinese dragon in but a few decades. It has become a fundamental democratic model for many developing countries with a dynamic growth of 7-9 per cent per year. And contrary to the Chinese mentality of copying everything from the West and retaining nothing of the soul, either of the communist ideology or religious ties, the people of India are themselves innovative, open minded and deeply rooted in their different religions. 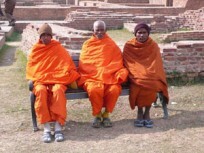 Eighty-five percent believe in their God as practicing Hindus, Moslems or Christians and lead a tolerant way of life. India has just started to awake and to learn to run in addressing its many social problems, including poverty. I am most impressed by the soul of India, the miracle of Indian tolerance and the way one billion so different people with so many religions and local roots can live together in peace and work in good faith with optimism for a better future. First, you should begin with an appetizer, an excellent book about this sub-continent. I highly recommend “The Elephant, the Tiger and the Cell Phone – Reflections about India the Emerging 21st-Century power” by Shashi Tharoor (Arcade Publishing New York) whom I met in New York and again here in Mumbai. Shashi is one of those amazingly intelligent Indians you want to talk to for hours. He was India’s candidate to become UN Sectary General and worked as the youngest-ever Under Secretary General of the UN. He is the author of nine interesting books about his home country, and is currently—as are so many Indians—a successful businessman as chairman of the Dubai-based Afras Ventures. He gave me a laser-like introduction into India, and I will include some of his statements and analyses in this article. The second gateway to India is to acquire a first-hand impression by visiting this fascinating country and watching, hearing and feeling the soul of India, observing her many facets which are like the pieces of a puzzle and the diversity from the high mountains of the Himalayas to the shores of the Indian Ocean. Let me point out some of the many puzzle pieces I found most impressive when visiting the political center in New Delhi, the cultural center of India and Hindu Holy City Varanasi on the Ganges river, Bodh Gaya near Nepal, the birthplace of Buddhism 2500 years ago, and the economic center and boomtown Mumbai at the Indian ocean. India, which turned 60 on August 15, 2007 after declaring its independent non-violently from the British, is now themost important country for thefuture of the world—a young country marching confidently towards the future. With its 1.1 billion inhabitants, currently every fifth man or woman on our planet is an Indian. It is an optimistic country with self-confidence and positive energy. India has just started to pick up speed. It has come out of the dark period of colonialization, and suffered significantly from the separation of its mainly Moslem parts in Pakistan and Bangladesh resulting in several bitterly fought wars between brothers over Kashmir. The newly established country began with state capitalism, which included the neglect of the agriculture sector in the 1950s. In the 1960s, India found itself in a phase of stagnation, which was followed by a socialistic approach in the 1970s focussing on redistribution before the creation of wealth and was badly managed by bureaucrats. Thus, for the first 40 years India was a slow-moving Elephant locked within many boundaries. It was only when Rajiv Gandhi was Prime Minister from 1984 to 1989 that a new dynamic took hold with a liberalization of industries and a U-turn away from an insufficient state socialism. From that time on, the Indian economy has exploded from only 3 to 4% GNP to more than double that for the last 25 years. Understanding India’s past and future requires an analysis of four strategic factors: democracy, demographics, technology and globalization adaptations, argues one of its most successful Mumbai businessmen Mukesh Ambani, the owner and managing director of Reliance Industries with 140,000 employees, $27 billion in revenues and a net profit of $2.7 billion annually. India is the global test case of whether growth in developing countries can be successfully managed within a democratic society or rather only within a totalitarian state and one-party controlled framework. Will China or India win? "India is the global test case of whether growth in developing countries can be successfully managed within a democratic society or rather only within a totalitarian state and one-party controlled framework. It looks now that the Indian elephant has turned into a tiger and will soon devour the Chinese dragon in but a few decades. It has become a fundamental democratic model for many developing countries with a dynamic growth"
Mr. Ambani sees his homeland in the lead for the future. First, India had proved that democracy works in a developing country. The political power in New Delhi has been peacefully transferred several times. Ethnic minorities live in peace. In the United States, since its independence, all Presidents have been male, white and Christian. Not so in India with a power-sharing between Hindus, Moslems, Christians. Today, Sonja Gandhi leads the ruling party with a Sikh minority Prime Minister Dr. Singh and a newly elected female President Pratibha Patil. India’s second richest man, whose father started in the 1960s with just a few dollars, argues that democracy gives people oxygen to be creative, and only with a maximum of creativity is there maximum growth. Young and full of hope and optimism. Forty-four percent of Indians are now younger than 19. In the next 20 years, 400 million will be under 36 joining the working force which will grow to 615 million. India has become the fastest growing consumer market in the world. Female power: In its one million villages, 36% of the representatives are women with one third of the local councils headed by them. More women join the workforce and new fields than men. Women are powerful in politics with positions such as Indian President, party leaders, regional state heads, or the mayor of the boomtown Mumbai. India has shown its remarkable capacity to absorb, apply and upgrade sophisticated technology having a great competitive advantages, argues Mukesh Ambani. Starting with information technology, India is now expanding into the life sciences and renewable energies with the research and development centers of large global companies like Siemens. Innovation had become integrated into the ethos of the Indians. The country welcomes and embraces globalization as a possibility for growth and integration with the world. It sees more opportunities than risks while preserving its roots and identities. Proud of their history and themselves. The new elite and the rich do not merely copy Western styles but are proud of their Indian heritage, only adding Western luxury, ideas and technology to their Indian world. This is easier for them than for others as Indians come from a world of diversity with thousands of years of experience in retaining what they are and learning from others. An English-speaking, educated, professional and entrepreneurial class who are driving change and prosperity. A land of contrasts, where millions live wretched lives amid poverty along with the largest number of billionaires of any country in Asia—higher even than in China or Japan. A country growing by 18 million new Indians each year. 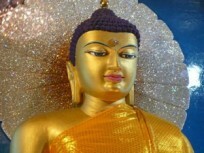 "The image of Lord Buddha housed in a diamond throne chamber of the Mahabodhi Temple, the holiest of all Buddhist shrines in Bodh Gaya near Nepal, the birthplace of Buddhism 2500 years ago - India is a tolerant religious mixture of Hinduism, Buddhism and many other believes, living for the most part peacefully together for more than 1000 years." A tolerant religious mixture of Hinduism, Buddhism and other beliefs like Sikhs living for the most part peacefully together for more than 1,000 years. This also includes a small Christian population of only 25 million and several thousand Jews who arrived here 2000 years ago escaping Gailee after the destruction of the second Temple in 70 ce. This Jewish community never suffered a pogrom like in Europe for that long. Only 5 per cent of Indians do not believe in God, whereas 85 per cent do. A highly de-centralized country with 29 strong regional states, which are sometimes progressive and sometimes backwards according to their different political leaders. These extend from 40 to more than 8000 meters above sea level with the high, snow-covered mountains of the Himalaya. Eighteen national languages—including English. Only 42 per cent of the population speaking Hindi. 29 languages are spoken by more than 1 million and 122 by more than 10,000 Indians. The country counts no less than 15,000 dialects. Still not enough awareness of nature and environmental protection. Indian streets are littered with every kind of trash, looking unclean, dirty and dusty. There is still not enough education to preserve nature in contrast to the preaching of Hinduism and Buddhism. The Holy River Ganges looks like a large waste pipeline full of trash, mud, and is black rather than blue. Seventy percent of the population continue to live in undeveloped villages resembling a third world country with almost no toilets, fresh water or electricity. Still too many poor. 300 million Indians subsist on less than one dollar per day. On the other hand, 300 million belonging to the growing middle class. According to the Indian National Council of Applied Economic Research, 10 million Indians are able to buy the world’s most expensive brands, another 50 million can purchase the cheapest items in a product line, and a staggering 140 million Indians can only realistically afford a pair of Levi’s or a Swatch watch. Former long-time Defense Minister George Fernades, a member of the WSN International Advisory Board, argues during a meeting in his home that this is the main problem which remains to be solved. The gap between the poor and the super-rich widens, and the rich care too little about the poor. Extreme poverty in the streets including many children who are not sent to school by their parents. There they would receive free nutrition but instead are forced to earn money for their family by searching through trash for useable things to sell. Dr. Hubertus Hoffmann meets the Tibetan monk Lhakdor, a close aid to his Holiness the Dalai Lama, and the director of the Library of Tibetan Works and Archives, at the Chaukhandi brick stupa where Lord Buddha met his five companions on arriving in Sarnath near Varanasi. Nobel Peace Prize Winner Professor Muhammad Yunus has now started his model of micro financing in India, which has been so successful in his home country of Bangladesh. More than 100 million people have received credit of between USD 30–50 to start their own small businesses in the street as an alternative. He told WSN that the most important aspect is to give the poor the capability to work for themselves and not just a charitable donation which only lasts for a few days. We need a perpetual system of many social businesses helping people to break out of the circle of poverty. To this end, he is in cooperation with Danone to provide cheap yoghurt as well as with other companies for drinking water and health care. He also proposes a Global Social Stock Market and new Social Business Funds. His vision is that everybody on earth should live without being too poor to pay for essential human needs. The World Security Network supports Professor Yunus and his vision of a world without poverty. Great local leaders in progressive states push the development of India forward. One such leader is Narendra Modi, Chief Minister in the state of Gujarat. His track record includes: the establishment of 11 new universities, providing drinking water to 4,698 villages and 24-hour electricity to all 18,000 villages in his state, increased power generation by 2,456 MW in five years, 54% of private sector jobs generated in India with an annual growth rate of 10.6% as opposed to a 7.6% average. Gujarat is the only state in India with a reduced financial deficit, a reduced the dropout rate of school children from 49% to only 3% in five years. 100,000 additional teachers have been recruited, and 2000 centers to teach English have been opened. It was recognized as the best state in the implementation of poverty alleviation schemes under the 20 point program for five years in a row, judged as the best e-governed state in India, has had no communal riots and not a single incident of terror during the last year—congratulations! This state provides a best practise example of what can be achieved politically and locally in India today. Invest in India: Foreign Investors have excellent opportunities in the Indian market as there is increasing demand from the middle class, industry and infrastructure. I do not expect that India’s economic boom of 7 to 9 per cent will be hurt much by the slowdown of the U.S. economy and a recession there. The rise in oil prices will not have a major impact as it is paid in softer USD instead of the stronger local currency, and Indian exports to the U.S. are still not significant. 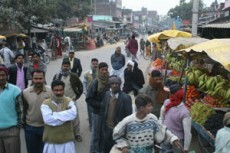 Go local: India is not one homogenous country but is developing quite differently in the cities and qualified states. The mentality of various centuries and mindsets will persist in India for some time. India is stable: In relation to its size, India is very peaceful and stable. As a tourist you are very safe. 160 million Muslims live in India today; there are no major incidences of hatred. Apart from some terrorist training activities which will not draw much support, peace prevails. Only occasionally do a few radicals feed resentments, and only three holy sites with both mosques and Hindu shrines are disputed in this large country and are therefore heavily protected. Help the poor by joining the micro-lending and social business ideas of Nobel Peace Prize Winner Mohamad Yunus. India as a best practice example for tolerance: India is a best practice example of how large, diverse ethnic groups and religions can live peacefully side by side—a dream of Mahatma Gandhi has come true. India’s founding father Mahatma Gandhi once said of his own faith that he had “broadened my Hinduism by loving other religions as my own.” One of his innovations was inter-faith prayer meetings, where texts of different religions were read and sung to a mixed audience. Gandhi believed that there was no privileged path to God and that human beings should hold to the religion they were born into and strive to become truth-seeking and better Hindus, Moslems or Christians. In his speech to the International Fellowship of Religions at Sabarmati in 1926 he said: “We can only pray, if we are Hindus, not that a Christian should become a Hindu, or if we are Mussalmans [Moslems], not that a Hindu or a Christian should become a Mussalman, nor should we even secretly pray that anyone should be converted, but our inmost prayer should be that a Hindu should be a better Hindu, a Muslim a better Muslim and a Christian a better Christian. That is the fundamental truth of fellowship.” Gandhi also urged to recover and reaffirm those truths in each religion that oppose violence and discrimination and promote justice and respect of others. "India’s founding father Mahatma Gandhi once said of his own faith that he had “broadened my Hinduism by loving other religions as my own." Gandhi believed that there was no privileged path to God and that human beings should hold to the religion they were born into and strive to become truth-seeking and better Hindus, Moslems or Christians." Gandhi disliked extremists whether they were Christians, Moslems or Hindus. In 1948 he was murdered by Nathuram Godse, a Hindu extremist, who saw inter-religious dialogue as a denial of the Hindu essence. Only in January 2007, were the rest of Gandhi’s ashes, which were kept by a friend, thrown into the Indian Ocean during a ceremony, not far away from the 300-foot yacht of Indian tycoon and Kingfisher aviation billionaire Vijay Mallya and the poor children on the beach of Mumbai, its high skyscrapers and the legendary Taj Palace Hotel.